Hands down, the number one reason I have enjoyed working in and around the RF industry for the past several years has been the intelligent, interesting and colorful people I have come to know. Strangely enough, many of those relationships began on Linked In. Last fall, I connected with an RF/MW designer via Linked In that appeared to share some common area of interests. I also noticed he was located in nearby San Diego—just a couple hours south of me here in Orange County. We swapped emails and promised to have a phone call when time allowed. Well, like most busy professionals, we kept putting it off. Finally, we spoke in early January. The more we learned about each other’s work, perspectives, and interests–the more the sparks began flying! We followed up our call with a lunch meeting a few days later. 3 ½ hours later….we parted with enthusiasm, both knowing we’d found a new friend and kindred spirit. Well, like all good things I stumble upon I knew immediately I had to share him with you! Norm Swanberg has been designing RF/MW products since 1973, and has enjoyed a long and illustrious career. Yet with all that tenure, he is one of those ageless souls that stays current and engaged with today’s world and emerging technologies. In addition to his professional interests, Norm is a Jazz fanatic. 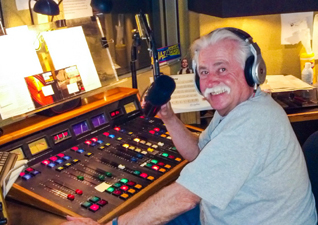 In fact, he is a part-time evening DJ on an award winning, non-commercial jazz station in San Diego, KSDS-FM. What has kept you excited and engaged in the industry for so many years? “Well, to start with, I worked at Microwave Associates, that evolved into M/A-COM, then eventually Tyco and Cobham and Alpha Industries, doing Gunn Diodes and GaAs applications…an industry that has evolved into Skyworks. I also worked for Hughes Aircraft and TRW (currently Northrup Grumman) in the military R&D areas. With IBM, I was the system lead for WCDMA chip set development where I had the great opportunity to do business travel in Europe and Japan. And, of course, there were the series of startups along the way, with the rest of the wireless community, hoping to make our fortune. Some of us did, many of us didn’t! “It’s kind of funny because I remember early in my career having an older engineer ask me, somewhat pessimistically, if I thought there really was a future in this RF stuff. Little did he know that those RF applications were a pretty darn good training ground for the wireless revolution that eventually emerged. Now the opportunities seem almost limitless. But in that timeline, the RF/Microwave went through some pretty tough peaks and valleys, especially when most of the work was tied to military/defense spending. One of my toughest jobs as a manager during those periods was actually having to decide people’s fate and telling people face to face we had to let them go. “Sometimes, it’s those little accidents in life that have the most profound impact. I went to the Newport Jazz Festival during a period when what was referred to as Fusion Jazz was emerging. To appeal to a younger crowd and to demonstrate the connection between this emerging genre and traditional jazz, the promoter, George Wein, offered an evening of Jazz Rock with Blood, Sweat, & Tears, Jeff Beck (with Rod Stewart as his vocalist at the time) and a variety of others. I had my “Jazz Epiphany” with Rashaan Roland Kirk, a blind saxophonist who came on stage with a stove pipe hat decorated with the stars and stripes, and about 4 saxophones strapped around his neck (he sometimes played 2 or 3 at once!). I was so wowed by the music and the INCREDIBLE musicianship of the jazz players that I started studying and listening and have never looked back. Look forward to more blogs and seeing you all at IMS 2015! Judy Warner is the western regional and RF/microwave market director of business development for Zentech Manufacturing, a contract manufacturer that offers fully integrated supply chain solutions for mil/aero, RF/microwave and medical markets. Zentech is based in Baltimore, MD near the high technology corridor of the Mid-Atlantic/Pentagon region. Judy has over 20 years of experience in the electronics industry, and has spent the past four years focused exclusively on RF and Microwave technology solutions. Judy also sits on the advisory board of eSurface technologies and contributes articles to a variety of microwave and electronic industry trade publications, including 3 years as a contributing guest blogger for Microwave Journal.